How to import to Mali? 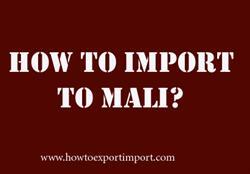 What are the import procedures in Mali to move goods? Explain about import registration process, cargo movement to Mali from overseas countries, Import delivery process in Mali etc. Detail the import methodology in Mali. This post explains about step by step procedures that need to be finished with Mali government authority for importation to Mali. Understanding the right documents is essential for smooth import and export procedures. In many cases, the documentation may also vary depending on the country of origin or destination. The documents may have to be prepared in a special way to comply with the requirements of the import or export country. Any delay in filing or absence of documents can delay the clearance process and thereby importer supposed incur demurrage on the imported cargo but also stand to loose business opportunities. This post explains about different phases in import process that every importer needs to go through in Mali.